You've pulled some GREAT choices out of relative obscurity, here. I'd forgotten SECRET SIX even existed. Some awfully good covers, too (again, SECRET SIX!). 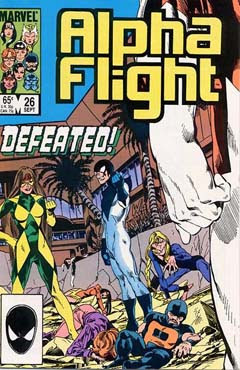 I might be inclined to make a case that ALPHA FLIGHT, EXCALIBUR, and NEW MUTANTS aren't quite in the same realm as the others, since they did quite, quite well in their hey-day-- but they've certainly faded with the passage of time. With ALPHA FLIGHT, in fact, I would pull Vol 1 and offer Vol 2 (I think it was), which had a much more isolated feel to it, and had set itself up with lots of interesting long-range threads. But it was an almost entirely new cast of heroes, and it was cancelled pretty quickly. 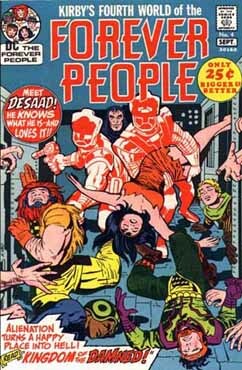 Same happened with John Byrne's DOOM PATROL reboot in. . . the late 90's, was it? Quite an enjoyable outing that never seemed to catch fire with the prevailing guns n' pouches crowd-- and then it was gone. STRIKEFORCE:MORITURI-- man, what a tough-love endeavor that was. The art was at times extremely good, but IIRC it ran in "real" time (or tried to) with the "real" world, since the powered characters all had a very specific shortened life-span, and the "hook" was that they really did die when their time was up. Yeesh-- that sounds dark even by today's standards. It also was not part of the shared Marvel Universe, so it didn't have that automatic continuity boost. So, eliminating issues I do have already-- what to pick? Infinity, Inc ('cause I love their ties to the JSA and have liked the couple of other issues I have from that run--- although color-separation experiments do mar it just a bit). My first two choices are easy - All-Star Squadron is one of my all time favorites. Roy Thomas at the top of his game, and even though there was a bit of a revolving door with the artists, the art was almost always excellent. I felt like I was getting two history lessons while reading this, one in WWII, and the other in Golden Age comics. My second choice is Alpha Flight. The Byrne run is another one of my all time favorites. He left after #28 (luckily #26 is pictured above) and the series really collapses after that, both the writing and the art. So, I'll give myself a little more Roy Thomas with Infinity, Inc. (hey, where's Young Justice?) for my third choice. It comes down to a tossup between Freedom Fighters and The Eternals for my fourth and final choice. I only have one issue of Freedom Fighters, but I enjoyed it quite a bit, while I have most of The Eternals. 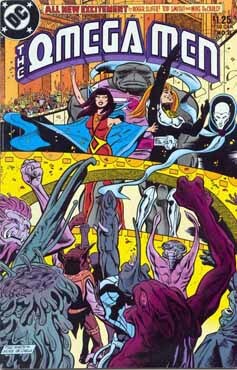 I guess I'll go with the cosmic scope of The Eternals from the King rather then the exploits of Doll Man and company. Tough call for me, though, actually. Alpha Flight is my first choice. At the time I only read about 7 issues, but recently I read through the first 3 TPBs (first 30 issues or so) and found them very enjoyable. The characters are interesting, and Byrne's art and writing are very good. 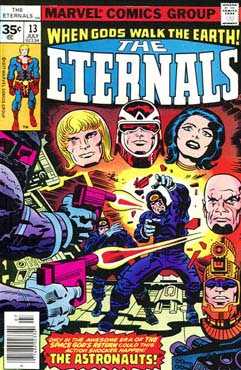 Forever People and Eternals are not my favorite Kirby, so I'll pass. I was excited about All Star Squadron at the time, but trying to get into it again I found it on the dull side. For my last 2 choices, I'll go with Secret Six, as I know nothing about it and that's a striking cover, and The Outsiders as it has Aparo art and I've heard good things about the stories. The Outsiders Annual #1 is one issue I do have, with excellent art by Kevin Nowlan. I remember reading an issue or two of almost all these titles-- fun topic, Martinex! My 4 choices would be Defenders of the Earth, New Mutants, Alpha Flight and the Eternals. - Mike 'good to see some obscure choices here' from Trinidad & Tobago. 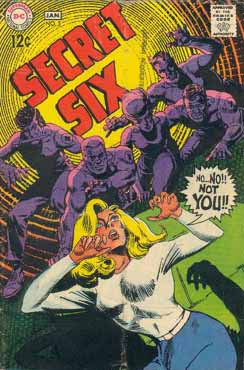 HB, the Secret Six was a short lived series about covert operators on special missions led by the mysterious and never identified "Mockingbird". I have to say that the relatively recent version (c. 2005) by Gail Simone from the "Villains United" era, was quite enjoyable. The group of bad guys led by Catman was really quite fun and exciting. I was torn on including Alpha Flight, Excalibur, New Mutants etc in this list. I concluded that a) without their core creator ( i.e. Byrne) involved they tanked fast and b) they don't really have many i(if any) stand-alone iconic heroes. The closest would be Captain Britain out of the whole set of rosters; I think other than CB no character had their own ongoing. I personally thought Alpha Flight was a great read, but what an odd team and perhaps really a non-team even moreso than the Defenders. I believe in their first year there were ten issues wherein the team didn't even appear together; it was really a series of team member solo stories. And then (SPOILER ALERT) they killed their probably most recognizable team member and leader, the Guardian. Garett, I know nothing about Defenders of Earth also. 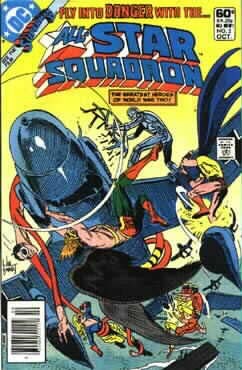 I remember it on the racks and I flipped through it but never purchased it, but like you I am intrigued by Phantom Flash Gordon, and Mandrake. I think that little cartoony character on the cover in the lower left corner turned me off. For me, I never read much of the Freedom Fighters. Uncle Sam is such a bizarre and also goofy looking character (even amongst costumed characters), but I'd like to read that. Also, Infinity Inc interests me for the JSA connection as well; and I like the Obsidian character (from this era at least). 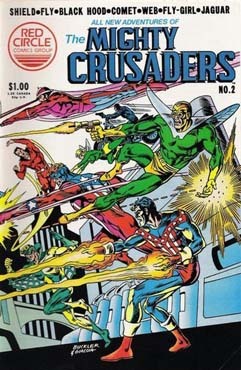 I'm also curious about Archie's line of heroes with the Crusaders, so those along with Outsiders are my choices. I would get All-Star Squadron for many of the reasons listed above - ditto Infinity, Inc. 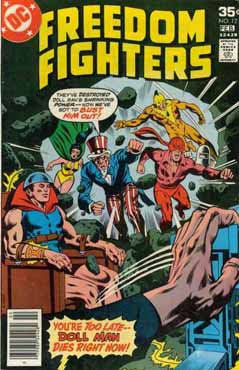 The Freedom Fighters always caught my eye as a kid, but never enough to pick it up. I'd get that. 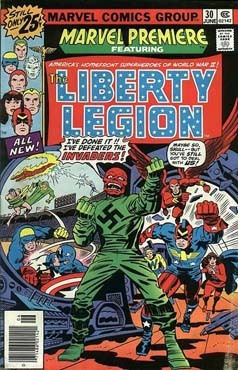 I had the Marvel Premiere with the Liberty Legion, so could leave that lay there. 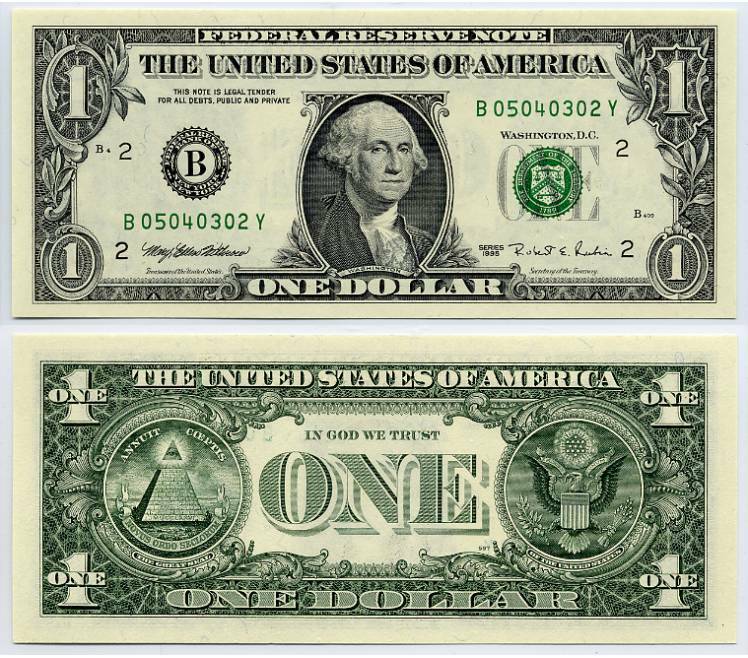 For my fourth book? Probably give Doom Patrol or Secret Six a whirl. Easy choice: I'd just get four from the series I'd never read, but have always been curious and/or heard good things about: Red Circle's Mighty Crusaders, Strikeforce: Morituri, Suicide Squad and Secret Six. Out of the bunch of those, I liked the retro-WWII and Earth-2 teams. And the Metal Men. I could never quite figure out why MM never caught fire. It was IMO easily the best DC comic of its era. Dorky characterizations, but that was kind of de rigeuer at DC. Iron was definitely a Superman knockoff; Gold a bit of the analytical Batman; Mercury was an early Guy Gardner. To my knowledge they never tried to make MM "hip," which made many a DC comic of that era groan-worthy. Pat, re: Metal Men. 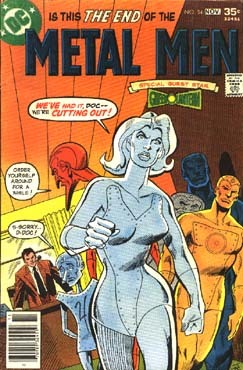 Yep, I used to have that whole run of issues from the revived Metal Men in the 1970s, and enjoyed them very much. The stories were really solid and fun, and the art, first by Simonson and then Staton, was top notch. Fun topic, Martinex1! Always enjoy talking about some of the lesser- knowns. 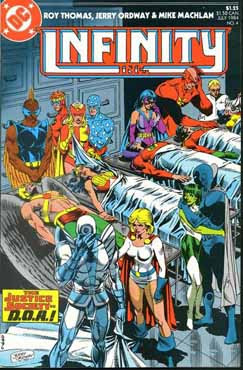 And some of these today are alien to me: Defenders of the Earth ( although I recognize the participants), and Strikeforce:Morituri. 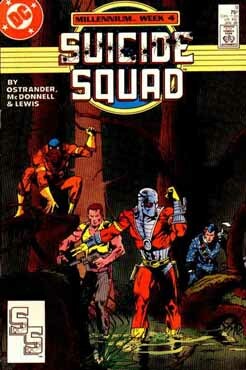 All-Star Squadron ( have never read it, but have heard so much). I read Metal Men sporadically when I was very young. And I don't recall all that much beyond their general and broad characterizations. As robotic creations, did their personalities evolve in a way that the stories became character driven? Were they comparable to the likes of Vision and Red Tornado? In your opinions what was of interest? Was their book mystery or suspense based? Was it adventure or super hero centric? I'm honestly curious. And Redartz, I thought about the Inferior Five and then just dropped the ball on including them. Busy day today, but I had to chime in since Strikeforce:Morituri was mentioned. Director-actor-writer-comic fan Kevin Smith spoke in my town recently. He talked about how he and his friends thought that series was the worst comic they'd ever read. Smith said that "Morituri" became code for something that was extremely bad. As in "That movie sucked, it was Morituri-bad." What, no Marvel?! 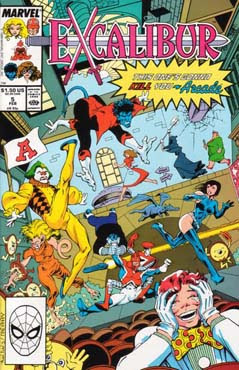 The only Marvels that caught my interest were New Mutants (which is OK, but it's no X-Men),Excalibur (which I generally like, though it got a bit too "zany" sometimes), and Alpha Flight (and I already have that issue). As for the final two, it would be a hard toss-up between: All-Star Squadron, Liberty Legion, Freedom Fighters, and Secret Six (the last for some Silver Age flavor). Incidentally, I recently picked up All-Star Squadron #1 (dated Sept. 1981), and I wasn't expecting too much, but it's far better than I thought it would be. Good title. 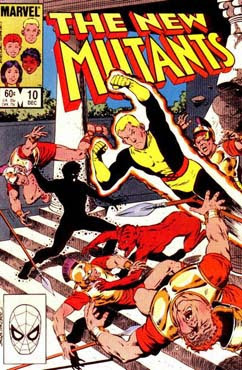 Martinex1, What made the Metal Men fun was the molecular chemistry that was at the center of each issue. The MM were not robots. per se, but solid metals given life by their Responsometer brains, and so their powers focused on their capabilities as specific metals. Tin was kinda worthless, but made a good team mascot, lots of heart even though he was typically destroyed by the end of each issue. Gold was about as close to Reed Richards in powers and intellect as DC ever got. Mercury was a hot head and rather prideful of his powers and disdainful of those of others. Platinum was annoying, but no more so than any other female depiction of the era. From an adventure standpoint, they were a lot like Challengers of the Unknown or FF, getting in to trouble due more to whatever craziness their creator was up to at the moment more than being a "team" committed to fighting crime, advancing justice, or whatever. When they did bump into opponents they were like Chemo or Metamorpho or Eclipso or Metallo (I see a pattern there), with focus on the science of their powers, which the Metal Men's ductility or conductivity or lead shielding or whatever would attempt overcome. 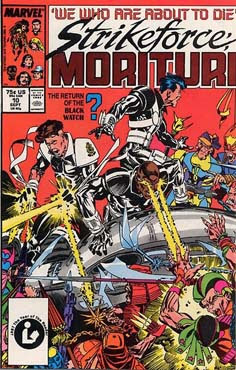 The MM got destroyed quite frequently, almost every issue, and were back again in full spirit. Quite creative, and generally pretty fun. Walt Simonson's art was never better or more iconic, and that was also a plus. Thanks to the info Pat. That sounds kind of cool. Now, what was the reasoning that they and the CHAMPIONS didn't make the cut, MX1? I'm muddy on that. . .
Oh! And it wouldn't have been off-base to see DP7 offered, now that I think of it. 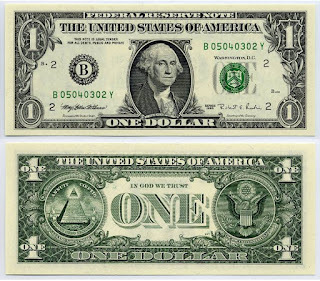 They remained my favorite remnant of the New Universe by a wide margin-- stayed with 'em til the very end, I believe. Metal Men, Doom Patrol... what's the difference? Ha, I knew this would come up. HB, I suppose the Champions and Doom Patrol could have definitely made the cut. The rules to these games are a bit vague I admit. My reasoning, as flawed as it may be is as follows: The Champions despite having a short lived series are often discussed here, and I was trying to look at groups that haven't been debated here as much. Also, in my mind the team consists of one A-Lister (Black Widow) and 4 B-Listers including two X-Men. And almost all have had their own book or mini-series. Regarding the Doom Patrol- that may even be more of my bias in that I've always liked them and consider them a notch above the other DC groups listed here. Despite a "no-star" lineup, they have had a number of series and reboots. And in a selfish vein, they are part of a future challenge I have in mind and I try not to overlap too much on topics. So I will leave that as a teaser for a Summer challenge! But please make your case for any others if you see fit; that's the fun of it.. Mike Wilson mentioned that he considered some of the offerings today as A Listers, I enjoy hearing that. The different perspectives are fun - aren't they? DP-7 by the way would have been a great offering. I'm sure there are many others. Cheers! Alpha Flight - Written and drawn by John Byrne, nuff said. The Freedom Fighters - One of my favorite comics when I was a kid. Don't know why, I just really liked it. They were kind of like DC's X-Men in a way. Justice Machine - A great book. I think I had every issue at one point. One of my first forays into a non-Marvel or DC comic on a regular basis. 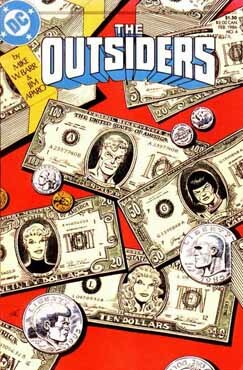 The Outsiders - I especially liked this title when it was "Batman and The Outsiders". This book is worth reading for the Jim Aparo art alone. Yeah Edo, I remember when the title started it was in a magazine sized format, then they reduced it to a more traditional comic book size. I very much remember the Cobalt Blue (great name) stories on the reverse side of the book as well. 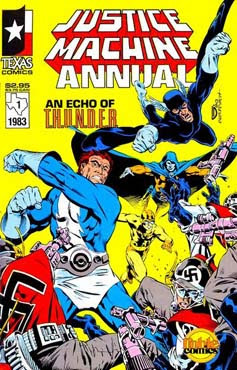 And I definitely remember getting that Annual with the THUNDER Agents crossover. Now that I think about it, I may even still have those books somewhere. I'll take a look and get back tomorrow. This was a time when there seemed to be a lot of indy-comic super teams cropping up in the comic stores. 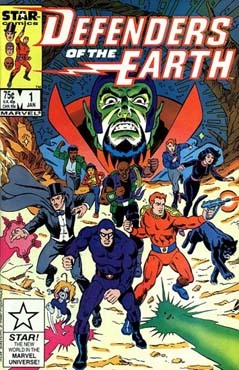 A couple of others that I really enjoyed reading were The Elementals (by Bill Willingham) and The DNAgents. There was even a Teen Titans / DNAgents crossover back in the day. It could never happen anymore, but I had a fondness for The Champions from Marvel. The Black Widow with Hercules, two former X-Men and Darkstar. An odd mix but fascinating. Infinity Inc had that early Todd McFarlane art going for it.